Designed to become one of the most luxurious and advanced vehicles ever constructed, the 2014 S-Class has an evolutionary design that incorporates a sportier front fascia, a larger grille and a gentle slanting rear end. The sleek styling enables the model to have drag coefficient of 0.24 which is pretty impressive considering the pint-sized CLA has a drag coefficient of 0.23. Overall, the short wheelbase model measures 5116mm long, 1899mm wide and 1483mm tall with a wheelbase that spans 3035mm. The long-wheelbase variant has similar dimensions but is 5246mm long and has a 3165mm wheelbase. Moving on to the cabin, drivers will find themselves surrounding by high quality materials and premium accents. Notable highlights include luxurious wood trim, metallic switchgear and stitched leather accents. There's also an analogue clock, a touch-sensitive telephone keypad and two high-resolution 12.3-inch displays - one for the instrument cluster and another for the infotainment system. The standard audio system has ten-speakers but the car can be equipped with a Burmester Surround Sound system or a Burmester High-End 3D-Surround Sound system. Speaking of options, the S-Class has them in spades. First up, there's an Air Balance package which filters and ionizes the air and can even dispense a "discreet and mild" perfume that won't get embedded into the seats or fabrics. If that's not impressive enough, the Warmth Comfort package comes with heated armrests, a heated steering wheel and improved seat heaters. The rear passenger compartment can be equipped with five different types of seats including Energizing seats that offer six different massage functions that use 14 air cushions. On the topic of seats, the First Class Rear Seat package has individual rear seats that are separated by a rear center console which houses Maybach-inspired folding tray tables. The package also includes thermo-cup holders that can warm or cool drinks. Even the suspension as gone high-tech as a Road Surface Scan system uses a camera to "watch" the road and look for irregularities. If one is found, it automatically prepares the Magic Body Control suspension to deal with the situation. The system is optional, but even entry-level models come equipped with an improved Airmatic suspension and an adaptive damping system. On the safety front, the S-Class offers DISTRONIC PLUS with Steering Assist and Stop&Go Pilot, Brake Assist PLUS with Cross-Traffic Assist, Active Lane Keeping Assist, Adaptive Highbeam Assist Plus, Night View Assist Plus and ATTENTION ASSIST. 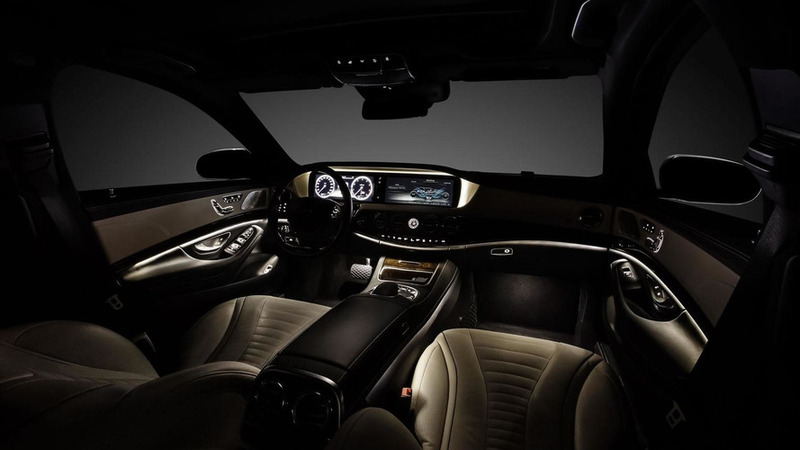 The S350 BlueTEC features a 3.0-liter V6 diesel engine that develops 258 HP (190 kW) and 620 Nm (457 lb-ft) of torque. It will enable the model to accelerate from 0-100 km/h in 6.8 seconds and hit a top speed of 250 km/h (155 mph). Moving up to the S500 will reward buyers with a 4.7-liter V8 petrol engine that cranks out 455 HP (335 kW) and 700 Nm (516 lb-ft) of torque. This will allow the car to run from 0-100 km/h in 4.8 seconds, before topping out at 250 km/h (155 mph). Next up, the S300 BlueTEC Hybrid has a 2.1-liter four-cylinder engine that develops 204 HP (150 kW) and 500 Nm (369 lb-ft) of torque. This allows the car to run from 0-100 km/h in 7.6 seconds and hit a top speed of 238 km/h (148 mph). Lastly, the S400 Hybrid will have a hybridized 3.5-liter V6 engine which produces 306 HP (225 kW) and 370 Nm (273 lb-ft) of torque. This will enable the luxury sedan to accelerate from 0-100 km/h in 6.8 seconds and have a top speed of 250 km/h (155 mph).